Yesterday, the Bisons unveiled their new primary logo under their new team affiliate, the Toronto Blue Jays. They are calling it a throwback to the late 80s and early 90s logo featuring Buster Bison at bat. Out of the four logo changes since the Herd began playing downtown, that red white and blue swinging Buster logo was my favorite. This logo, however, is a step backwards for the team. First of all, I’m convinced that the new logo is the result of a kindergarten coloring contest. It is far too simplified for what it tries to represent. If you wanted to create a logo with a simplified buffalo, you could do what the Bills have done. Both of their logos are crisp, clean and graphic while still obviously representing a buffalo. This logo has the necessary parts but the execution just isn’t there and it totally disregards basic design elements and rules. 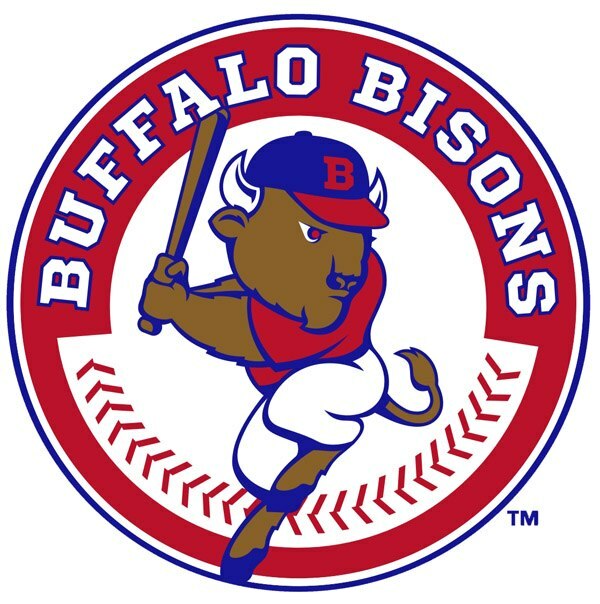 What made the old Bisons logo work was the way Buster Bison was humanized. We connected with him because his eyes looked real. It is almost overlooked that he has hands instead of hooves but, it’s still a spot on representation of a buffalo playing baseball. He’s even wearing his hat up high because a baseball hat wouldn’t fit on an actual buffalo. His oversized head made the logo more of a caricature and made it more fun. Those are the elements you need to make it work. In a realistic style logo, people look for those little details. Those elements were worked into the previous logo under the Mets affiliation. In that design, the buffalo is much more realistic looking. Still, the viewer connects with it because of the depth in the eyes and the little smile the artist added. Those things humanize the logo and draw people in. Don’t even get me started on how well color is used to represent depth in that logo. Which brings me to my next point; use of color. I’m a big fan of red, white and blue. I think they work well together and are unmistakably patriotic. However, they can also be atrocious. One big rule in design is that you never put red and blue next to each other if they are similar it brightness and saturation. The colors clash and it causes this weird glowing line effect that really hurts your eyes. Of course, the designer of the new Bisons logo completely disregarded this. Also, if you have two shapes of the same color touching each other, they appear to be one shape. This happens both at the top where the blue in the bat touches the “A” and at the bottom where the hoof touches the blue line. However, if those pieces weren’t touching and were just very close to the shapes surrounding them, it would cause what is known as “tension”. Tension is a negative design element wherein two shapes are placed very close to each other without touching, creating the same effect as two magnets of opposite polarity being pushed against one another. A perfect example of this is where the tail and the red lines of the baseball stitching meet up. Another is where the stitching and the hoof overlap and there is just a little red poking out. That being said, I do like the use of the stitching offset by the lettering. It just wasn’t done as well as it could have been. I think the best look the Bisons have had was during their years as the Indians affiliate with the green jerseys. The logo itself, I didn’t care for because Buster was sliding which is kind of a passive movement. However, the colors were awesome together. Red and green are two more colors you don’t want touching in a logo. The artist kept that in mind and added the gold color to prevent the red and green from clashing. It worked beautifully. I just goes to show that it’s the simple things that make a good logo great. Speaking of great logos, being that the Herd is now the Blue Jays affiliate, I would’ve loved to see a logo done in that style with the simplified three color side view of a buffalo head. It’s simple. It’s old school. It looks nice. Even if it were modeled after the more modern style logo the Blue Jays had a few years ago with the big J and the angry looking bird, I’d be happy with that. Really, anything would be better than this kindergarten art project. I’m looking forward to seeing what the new jerseys look like. I’m hoping they go with red pants but, I wouldn’t mind seeing the jersey that Buster is wearing in the new logo.